The 20-year-old Scot, who moved to Portugal from Dundee United in a £3 million move in summer 2014, has been restricted to playing for Sporting’s B team since the last of his five first-team appearances 13 months ago. 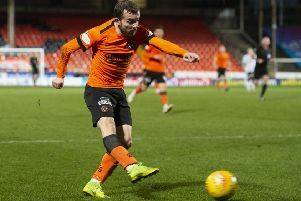 Although he knew from the outset that regular status wouldn’t come instantly, the little midfielder, who clocked up almost 50 first-team appearances as a teenager at Tannadice, feels he is now getting little benefit from playing exclusively in the Portuguese second tier. Having grown exasperated by his lack of first-team opportunities since Jorge Jesus replaced Marco Silva as manager last summer, Gauld asked to go out on loan in January. This request was declined by Sporting, who insist they still view him as a future first-team player and would rather he remained under their watch. Gauld, who played in a roving attacking role in his United days, has been reinvented as an all-action central midfielder in Lisbon. He played this position – the No 8 – for Scotland Under-21s in their defeat by France last week and the victory over Northern Ireland on Tuesday. Gauld believes he is now a more rounded footballer as a result of this tweak to his game. “This season I’ve played No 8 in the B team as the A team play a 4-4-2. I wouldn’t say I’m capable of being a striker or one of the two up top so it was easy for me to change to No 8. I’ve played there a lot now and I suppose that’s good for my career as I can play two positions. I enjoy it, I may not get forward as much or get as many goals but I’m on the ball more.